Bamboo Blade (2007) : Série TV de 1 saisons et 26 épisodes diffusée sur . Casting, acteurs, bandes annonces et actualités. Kojirou est un enseignant qui dirige également le club de Kendo du lycée où il travaille. Ayant des difficultés financières pour se nourrir, ce dernier fait un pari avec un ancien sempai qui possède lui aussi un dojo. Si l’équipe féminine de Kojirou arrive à gagner contre celle de ce dernier, alors il pourra manger à sa faim pendant toute une année. Le seul problème pour le jeune professeur est que son club ne compte que deux membres féminins, dont une élève qui n’a pas donné signe de vie depuis un moment. Le pari semble perdu d’avance jusqu’à ce qu’il rencontre Kawazoe Tamaki. Cette jeune fille au physique qui semble frêle cache en effet, un talent hors du commun pour le kendo. Refusant l’invitation dans un premier temps, elle va finalement rejoindre le club suite à un incident, en tant qu’ « allié de la justice ». Avec l’arrivée de Tamaki dans l’équipe, gagner le match semble alors possible pour la plus grande joie de Kojirou et des autres membres du dojo. 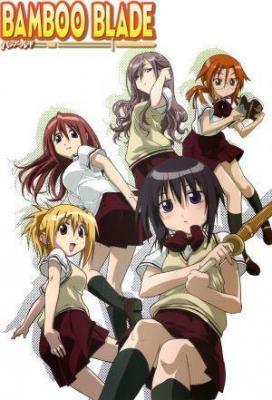 Casting de la série "Bamboo Blade"
S01E01 Le balais et l'alliée de la justice 02/10/2007 Kojir?, the coach of Muroe High's kendo club, makes a bet with his senpai, Kenzabur?, on a practice match between both schools, but the fighters must be 5 girls, no boys. Kojir? 's victory would mean he could eat all he wants at Kenzabur? 's father's sushi restaurant for a full year. Kojir? desperately needs to find more talented female kendo students because he only has 2 girls in his club. With only a month remaining before his match with Kenzabur? 's team, he meets an extremely talented freshman, Kawazoe Tamaki. S01E02 La valeureuse épée et le déjeuner 09/10/2007 Tamaki's motivation is presented in the form of her favorite tokusatsu, Blade Braver, and feels happy when toraji nicknames her "Red", the leader of the Club's female team. Her relationship with the other club members develop when they start having lunch together and sharing their bento, her everyday bento, however, consisted of a single umeboshi and rice, which she constantly made in honor of her parents, and couldn't share with the others. She start making "shareable" bento at the end of the episode, even though she fells she's disrespecting her parents a little. S01E04 Rose et bleue 23/10/2007 Miyako learns that the girl she had thrown in the lake the previous day was actually her senpai in the club, this leads her, in her "Pink" personality, to awkwardly try to hide her identity from Sayako to avoid any confrontations. She starts to enjoy more of the club's activities, even though being forced to train from early in the morning, because of the opportunities kendo give to harm others legally. She is eventually convinced by Toraji to apologize and befriends Sayako. S01E05 Lycée Muroe et lycée Machido 30/10/2007 The day of the match arrives, however, due to the unique personalities of it's members, the Machido High Kendo Club is awfully delayed. The real match starts very late in the episode, and the episode ends with Machido High's members awed by Tamaki's ability, after scoring a point in the first battle. S01E06 Kawazoe Tamaki et la tardive Bureiba 06/11/2007 After Tamaki's match, which ended in a victory for her, the other matches take place meanwhile she prepares to participate in the last match too. At the end, Muroe High School ends winning 3 wins to 1 loss and 1 tie. Therefore, Kenzaburo challenges Tamaki to a match, impressed of how a girl of her age with such a great talent is in a club like that. S01E07 Sushi et Katsu frits 13/11/2007 This episode picks up at the end of the previous one, starting with Kenzaburo revealing that he knew the fifth fighter (Bureiba) was actually Tamaki. His challenge to Tamaki is accepted and so Kenzaburo and Tamaki's match starts. Kenzaburo goes all out on Tamaki, and they both score a point, but in the third round, Kenzaburo starts out in Jodan. This forces Tamaki to have a flashback of her mother in the same position. Kenzaburo leaves the match as a tie, and then goes out to a sushi dinner with Koujiru where Koujiru finds out that Kenzaburo's father has given his restaurant away, making their bet void. 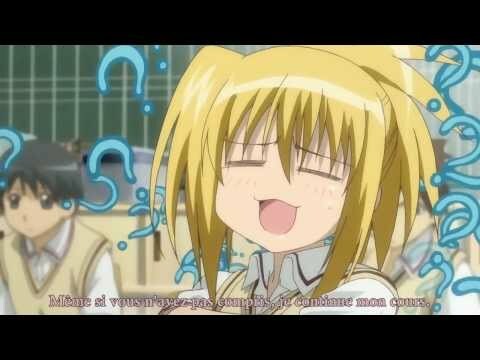 S01E08 Tama-chan et son travail à mi-temps 20/11/2007 Tamaki sees an anime package on TV that she wants, but later finds out that she does not have enough money for it. At the school's dojo, Tamaki overhears Miyako on the phone talking about how she could not work part-time that day. Tamaki approaches her and inquires about it. Miyako then asks Tamaki to work part time there, to which Tamaki agrees to. Tamaki's father at first disagrees with Tamaki getting job, mostly because the school does not allow students to work part time jobs, but then accepts because he thinks that Tamaki is growing up, and also she will use the money to buy him a gift for his upcoming birthday. S01E09 Les problèmes de Kojirou 27/11/2007 K?jiro has an incident in a public setting that places his teaching prospects at Muroe High School in doubt. With the rest of the club he resolves to get to the Nationals (or some similar honour) in an attempt to improve the club, gain distinction and save his teaching position. A weary Tamaki nears the end of her part time job filling in for Miyako. Then a suspicious customer arrives. S01E10 La mélancolie de Miya-Miya et la première rencontre 04/12/2007 The team enters the high school tournament. Only Tama-chan did well enough to win. Miyako meets her middle school classmate, Otajima Reimi who has a crush on her. Miyako as such became troubled and couldn't concentrate on her match. It was revealed that Reimi used to harass Miyako when they were in middle school. The episode ends off with K?jiro sensei discussing about a fifth member with Kirino, the club captain. S01E11 Animation et rêve 11/12/2007 Miyako reveals to the other kendo members that Reimi has been harassing her because during middle school she refused to go out with the captain of the mens football team, whom Reimi had already been rejected by. Try as she might, Kirino is unable to remember the name of the potential fifth female member who's studying at Muroe high school. Y?ji suggests that Kirino should call her friend up and ask for her name again, which she does. Armed with the name Satori Azuma, Kirino and Sayako begin to search for her. S01E12 Les circonstances d'Azuma 18/12/2007 This episode dedicates to Mei from Seimei high and Azuma from Muroe High. Mei joined Seimei High's Kendo club to get along with her friends, but many of her friends quit the club as they couldn't take the sensei's strict training. They gear up for the practice match with Muroe High, she had set her mind to quit after the practice match. K?jiro found out that Azuma didn't want to join the kendo club as her results in examinations were bad. Not because she wasn't able to do it, but she made careless mistakes. Nevertheless, Kirino drags her to the practice match. The episode concludes with Seimei High's Kendo team training against Muroe High's Kendo team. S01E13 Profs et élèves 25/12/2007 Muroe High School Kendo team won all their matches against Seimei high in the practice match. Azuma upon seeing Tama's Strong kendo skills become motivated and took part in the practice match. Before that, Tama had a match with Azuma, despite Azuma losing, she was impressed and therefore became motivated. Mei, from Seimei high who originally wanted to quit decided to stay on as she was impressed by Tama's skills. The episode end off when Seimei High's Sensei competed with Muroe's high sensei and won the match. S01E14 La détermination de Satorin et Gloups 08/01/2008 Kirino and Sayako continue their attempts to persuade Azuma to join the kendo club. Their attempts end only in tears. As they run through and around the school, Miyako hears their mobile lamentation and springs into action. She offers an excuse that she has cleaning duties, then sweetly dumps said duties onto her classmates. Alternating between a good friend, salesperson and snake cornering a frog she attempts to win over Azuma. Miyako's tactics eventually convince Azuma (and later her parents) to join the kendo club with the expectation/condition that it will lead to improved grades. With the team set (and the boys ignored) a training camp is announced. Due to a lack of funds, this intensive training will take place on the school grounds. Tamaki's father is perturbed especially when Tamaki confirms Y?ji Nakata will be there. S01E18 Lycée Muroe et l'après tournoi 05/02/2008 K?jiro and Tama have a little talk and wounds are tended to. Kirino must stand up in order for the team to keep fighting. The tournament ends and the team is back to base as usual, with Saya off somewhere and Tama alright. S01E19 Tatou et Pangolin 12/02/2008 Miya-miya and Dan-kun shops for a new Shinai at the Kendo store. There they meet Carrie, an expatriate living in Japan, who falls in love with Dan-kun at first sight. Miya-miya challenges Carrie to a duel. S01E20 Braver et Shinaider 19/02/2008 Yuji invites Tama to go to an amusement park that's hosting a Blade Braver concert. At the venue, She meets a girl called Rin who's a fan of Braver's rival, "Shinaider". They enter a fan-quiz to win Blade Braver dolls. S01E21 Kawazoe Tamaki et Suzuki Rin 26/02/2008 Rin and Tama along with the production crew go on location to film the new Blade Braver movie, where an incident gets both of them the replacement roles in the new film. The rest of the Kendo club members either practice or take the day off doing what they want. The episode concludes with K?jiro returning from his business trip. S01E22 Le vainqueur et la vaincue 04/03/2008 Muroe High goes to the Kanto High School Kendo Tournament. Miyamiya shows her improvement in practice, but fails to defeat Carrie in the tournament. Muroe makes it to the 3rd round, where Tama is finally defeated by Rin, and Muroe is pushed out of the tournament. Meanwhile, Toyama and Iwasa, two former members of the kendo club, are caught fighting in a video game arcade and destroying two machines. S01E23 Supercherie et silence 11/03/2008 The principal of the school tells K?jiro that the kendo club will be disbanded because of club members engaging in suspicious or risky activities—specifically, Toyama and Iwasa, who, ironically, have stopped attending kendo club but have not turned in any resignation forms. Kirino and Sayako are distraught when K?jiro reveals the news to them, and they protest the principal's decision, calling it unfair. Meanwhile, Miyako has an emotional breakdown over her failure in the competition and, surprisingly, refuses Danj?r? 's comfort. Tamaki, also unhappy over losing the competition, quits the kendo club, much to Kirino's dismay. S01E24 Épée et voie 18/03/2008 Kirino attempts and fails to prevent Tamaki from resigning from the kendo club, the latter already having decided to give up. Neither she nor Miyako decide to attend kendo club, and nobody knows Miyako's whereabouts. Eventually even Kirino decides not to attend, and the only members left are Satori, Y?ji, Danj?r?, and Sayako. Satori manages to convince Miyako to keep up with kendo, while Sayako dissuades Kirino from quitting kendo. Y?ji comforts Tamaki, telling her that losing is not as bad as she thinks, and Tamaki decides to learn j?dan to help improve her kendo skills. Eventually she decides to come back to kendo club, and the members are reunited. S01E25 Kendo et le rassemblement 25/03/2008 Muroe High goes to a national kendo competition and meets with many of their former opponents. Miyako, having watched footage of her previous kendo match filmed by Reimi in an effort to improve her kendo skills, manages to beat Carrie Nishikawa, the latter of which calls the former out for a match of their own and is beaten again. Tamaki fights Rin Suzuki again and wins by using the thrust attack. K?jiro, on the other hand, has emptied out his apartment, and in the last few minutes of the episode is shown getting on Nobu-chan's motorcycle and going to a different place--presumably his new home. S01E26 Présent et futur 01/04/2008 It is a new year and several months have passed since the National competition. Two freshmen show up to join the club. The members one by one appear trying to convince them to join the club only to perform sideshow tricks leaving the freshmen unimpressed. The club later have a sparring match which causes the freshmen to become enthusiastic about joining the club. Its later revealed that these two new members are the siblings of the previous members that quit. Kojiro returns back to school having settled the problem with the old lady that forced him to leave. At the very end of the episode Tama-chan encounters a long purple haired woman with blue eyes, hinting that Bamboo Blade may have another season to come. Envie de parler de Bamboo Blade ? Les discussions sont là pour vous. Retrouvez toutes les informations sur Bamboo Blade lancée en 2007 : synopsys, casting complet, acteurs, scénariste, réalisateur. Découvrez des séries similaires à regarder également. Faites vous une idée de la série grâce à la note des membres et aux critiques des internautes.